Thursday, October 19, 1911: That’s all. Since Grandma didn’t write anything of substance a hundred years ago today, I’m going to share another very old recipe. We often ate Apple Betty during the fall and winter when I was a child. It always seemed very old-fashioned and I’d guess that Grandma ate similar dishes when she was young. When I was small, we’d save bread crusts and tear them into small pieces. We’d put the torn bread into an open canister to dry. Whenever we got enough for Apple Betty, we’d make it. Farmers always had lots of apples in those days from their orchards, and I guess this was a way to use both the apples and the leftover bread crusts. We’d eat Apple Betty as a side dish during the main meal–though it could be eaten as a dessert. After I got older. I guess our family felt more prosperous and we generally threw bread crusts out—and we no longer made this recipe. Preheat oven to 350 degrees. 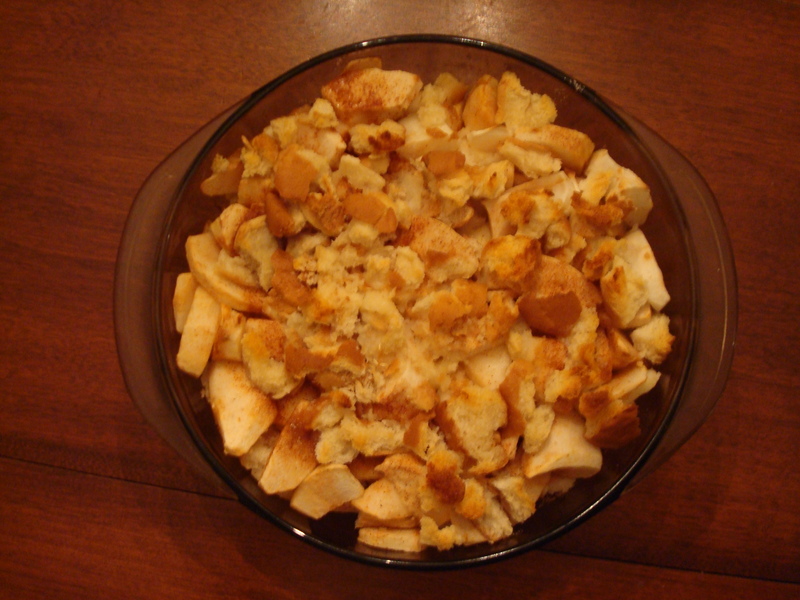 Put 1/3 of the bread crumbs into the bottom of a buttered 6 to 8 cup casserole dish, then cover with half of the apples. Mix the sugar, cinnamon, and salt together, and sprinkle half the mixture over the apples. Add another layer of bread crumbs and another of apples, and sprinkle with the rest of the sugar mixture. Top with remaining crumbs, pour lemon juice and water all over, and dot with butter. Cover and bake for 25 minutes. When I recently made this recipe, rather than sitting the bread crumbs out to dry, I tore several slices of fresh bread into pieces and put them on a cookie sheet. I then dried the very coarse crumbs for about one-half hour in a 175 degree oven. My husband Bill said that the Apple Betty reminded him of bread pudding—though the bread is definitely drier with this recipe than is typical of a bread pudding. The dish can be eaten either hot or cold. I prefer it hot, but Bill ate cold left-over Apple Betty and in no time it was gone. This historic recipe is a keeper. Posted on October 19, 2011 August 23, 2015 by SherylPosted in Food, recipesTagged apple, desserts. “That’s all” Haha. I love that. I feel like I’m getting to know your Grandmother, and I like her! Thanks for stopping by. As I’ve worked on this blog, I’ve also enjoyed getting to know my grandmother better.